2016 was a splendid growing season. I rated it a solid 9.0 on a scale of 0 to 10. Our grape growers really dialed in the proper amounts of fruit left on their vines which were able to fully ripen come September and October. The grape varieties Cabernet Franc, Cabernet Sauvignon, Malbec and Merlot performed exceptionally well. 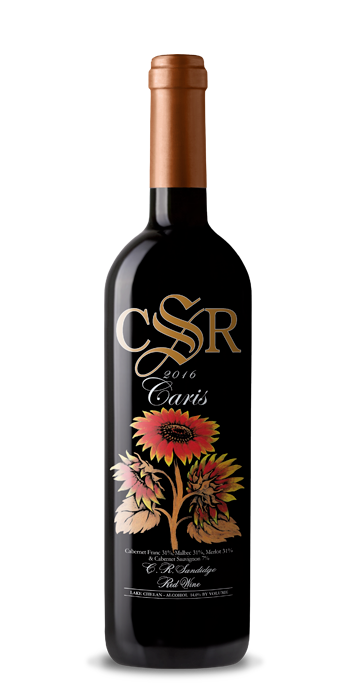 Great – ripe red and black berry flavors, fine grained tannins and modest acidity were what characterizes the fruit which ultimately was crafted into our 2016 Caris. 2016 Caris was made using grapes from two excellent Washington State vineyards. The Phinney Hill vineyard located in the Horse Heaven Hills AVA region supplied the Cabernet Sauvignon fruit. Phinney Hill is located in the middle third of its AVA. The terroir is amazing for growing red wine grape varieties possessing impressive depth and structure. Deep loam top soil exists prior to encountering fractured calcareous basalt and finally basalt bedrock. The vineyard growth is easily manipulated as it is easy to water stress. The Cabernet Franc, Malbec and Merlot fruit was harvested from the Lake Chelan AVA vineyard Amos Rome. This vineyard site possesses phenomenal potential. Decent south – southwest slope, deep sand – gravel soils and proper elevation make for an excellent future. Grower Tom Pettigrew is committed to growing some of our regions finest grapes. As he continues to tinker with each grape variety grown on his site, quality will only get better and better. All fruit was meticulously handpicked into ½ ton bins. Within hours, the fruit arrived at the winery to ensure the highest quality possible. All of the grapes were sorted by hand to glean out any damaged fruit or MOG (material other than grapes) such as leaves. The grapes clusters were destemmed and the berries lightly crushed into one – ton fermentation bins. The yeast fermentation proceeded on the grape skins at temperatures ranging from 51 – 88 degrees Fahrenheit over a twelve to fourteen day period. Once the yeast fermentation reached a Brix reading between 4 and 6, the wine was pressed off. The malo – lactic fermentation was permitted to occur while the wine was in barrel utilizing native ML bacteria. Eighteen months of barrel aging in new French and American oak barrels was deemed perfect. The wine was tightly filtered at bottling. The color is purple – red. Lovely- ripe red and black fruits are found in abundance on the nose. One will primarily detect blackberry, raspberry and red currant notes. Vanilla bean and toasted coconut compliments of the French and American oak barrel aging kicked in additional aromas and flavors. The mouthfeel is a very silky medium plus body. Fine grained tannins balance out the luscious fruit. This wine may be aged a good 6 to 8 years. A great match with warm gyros stuffed with succulent grilled lamb, peppers and onions. Top with a spicy tzatziki sauce. Thank-you for your friendship and support. Enjoy! !